In spite of significant advances in the diagnosis and treatment of most chronic diseases, there is evidence that racial and ethnic minorities tend to receive lower quality of care than nonminorities and that, patients of minority ethnicity experience greater morbidity and mortality from various chronic diseases than nonminorities. 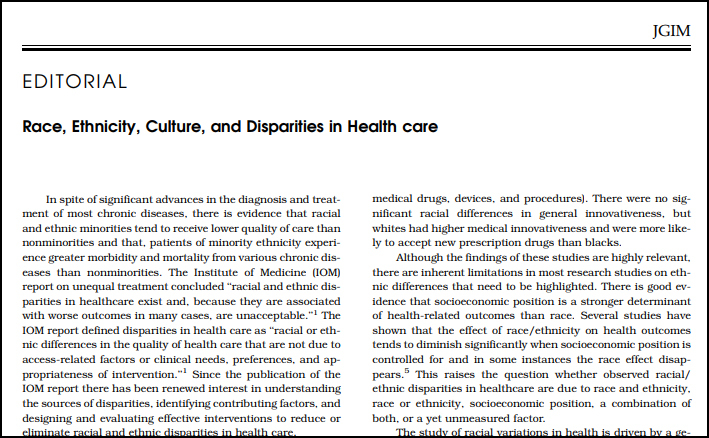 The Institute of Medicine (IOM) report on unequal treatment concluded “racial and ethnic disparities in healthcare exist and, because they are associated with worse outcomes in many cases, are unacceptable.” The IOM report defined disparities in health care as “racial or ethnic differences in the quality of health care that are not due to access-related factors or clinical needs, preferences, and appropriateness of intervention.” Since the publication of the IOM report there has been renewed interest in understanding the sources of disparities, identifying contributing factors, and designing and evaluating effective interventions to reduce or eliminate racial and ethnic disparities in health care. Three studies published in this issue of the journal provide new insight to the sources of and contributing factors to racial and ethnic disparities in health care. In the first study, Trivedi and Ayanian conducted a cross-sectional analysis of 54,968 respondents to the 2001 California Health Interview Survey to assess the relationship between perceptions of health care discrimination and use of health services. Approximately 5% of respondents reported experiencing some form of discrimination. Those that reported discrimination were less likely to receive some preventive care services; however, adjusting for perceived discrimination did not eliminate the observed racial, gender, and insurance disparities in receipt of preventive care. Journal of General Internal Medicine. June 2006; 21(6): 667–669.